It’s a ton – 100 days in. Big storm overnight. Lightning, thunder, strong winds and more rain. I don’t like the chances of the north bounders we were with last night in being able to cross the Rangitata and they might even have some difficulties down Bush Stream towards Mesopotamia Station. By morning it looked like it had cleared. The winds were still strong but blue shone through. 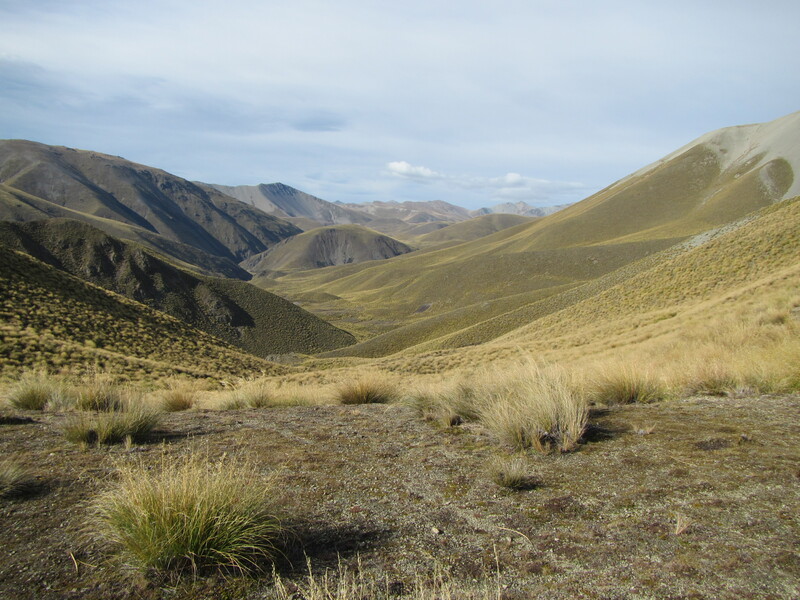 From Crooked Spur Hut it was straight into a long climb for an hour through high tussocks and up a scree slope to a saddle into a new valley system. The theme for the day was total landscape immersion and I realised that that is what Te Araroa offers any tramper right along the length of the country. The trail doesn’t just give you a taste of different landscapes, be they beaches, muddy forests, road walking, river valleys or high mountain passes, the trail gives you total immersion in each. Why walk through a landscape for a day when you can do it for 4 days or a week at a time. At the moment I am immersed, if not engulfed, in tussock country. There is no trail through these. Just the odd faint mark of where others have walked if anything. For the most part is find your own route through the stuff. For kilometres and kilometres. There is a lightly poled route through. Black pickets with orange pipe markers on top. These can be really difficult to locate and are often obscured in the head high tussocks. You have to look hard to find them but there are just enough to keep you headed in the right general direction. Often they will be located on the top of saddles or hills where they stand out on the horizon if viewed from below. The really tricky ones are down low with a background of tussocks to camouflage them. So yes, tussocks, tussocks and more tussocks plus some speargrass thrown in. For good measure, for just about the whole day, some 29 kilometres, minus a kilometre or two of rock and scree scrambling. But despite the tussocks walking the mornings terrain was relatively flat. Descending down from the saddle the route followed along an undulating line over a series of small ridges, saddles and the odd stream crossing towards Stone Hut for around 7km. I got here around 10:30am and was shortly joined by Steffen, Will, Liz and Carl for a morning tea break. These guys were only headed to Royal Hut today, only another 2 hours away, where as I has keen to get some kilometres in and climb over Stagg Saddle today, working my way towards Camp Stream Hut. It was going to be a big day. As much as I would have liked to hang around for a leisurely break I had to keep trekking, particularly while the weather was still semi favourable, and got myself going. Not far from Stone Hut, maybe 45 mins in, the rain started again. A good soaking rain and I was drenched in no time, but warm. I had my Icebreaker gloves on for the first time today given the chill factor and even had to wear shell mitts over the top to keep my hands warm. A sign of the weather heading further south? I reached Royal Hut in around 1.5 hours and got stuck into some lunch while I contemplated my next move. To stay in the hut or move forwards. In the hut I could strip out of my wet gear and get dry and enjoy a relaxing afternoon. Unfortunately there was no fuel around to get a fire going out in the middle of the tussock country so drying wet gear would have been impossible. 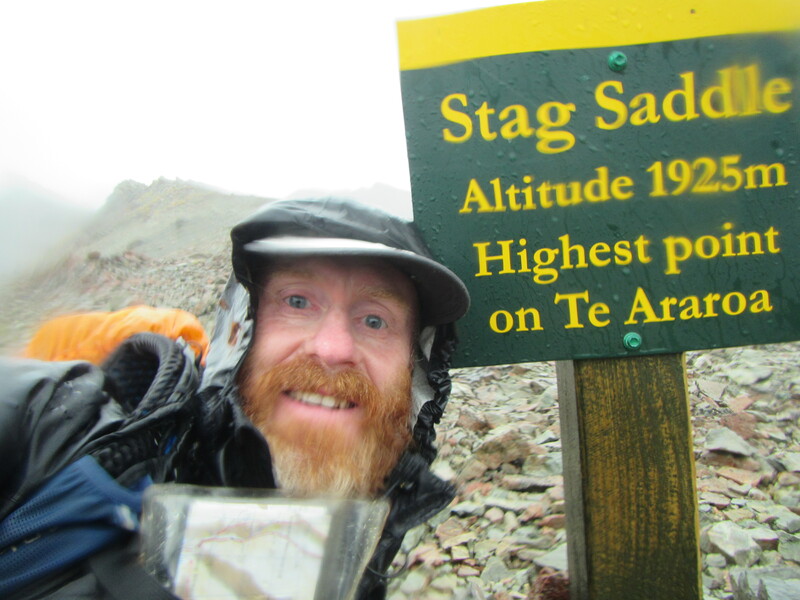 To keep going, I could getvmore distance in and while the wind held off could tackle Stagg Saddle, the highest point on Te Araroa. I couldn’t get any wetter. If the wind stayed off and I kept moving I would be warm enough. Decision made, I pressed on. Leaving the semi comfort of Royal Hut I headed back out into the rain and started toward the saddle. The first two kilometres was a gradual climb following an unnamed stream, crossing from side to side as required, before the terrain really kicked up for a 500 m section, climbing 200 m of what felt like near vertical terrain. A lightly poled route lead up over tussocks and scree slopes. Lots of false summits kept appearing. I’d see a pole on the horizon thinking this has to be the top only to approach it and see another, bigger hillside behind it. The rain was coming down hard but the wind held off. All good to get to the top and down across the other side. The ground was saturated. Every depression and minor gully filled and over flowing with water. Alpine peat bogs acting as sponges to soak it all up and felling like sponges under foot. Water seemed to be seeping out of everything, scree, rock and moss patches. Over the steepest ground the terrain flattened a little as the trail climbed on scree, eventually bring me out at Stagg Saddle. On top I could feel the wind and wasnt about to hang around. I grabbed a couple of quick pictures on top of the highest point onthe Te Araroa and was keen to drop down the other side. On a good day there is fantastic route that leads up even higher from the saddle to an open ridge top to walk on for a good 6 km with stunning views over Lake Tekapo and over Mount Cook. This wasn’t an option for me today. The cloud cover would have obscured any views and up even higher it was bound to be colder with the wind chill. The low land route it was for me. Unfortunately once off the scree from the saddle it was back into tussocks. No trail to speak of, only a lightly poled route to follow all the way to Crooked Spur Hut. i was drench and had to keep moving to stay warm so I was on a mission, a forced march to Camp Stream Hut. I was picturing a quiet hut all to myself with a roaring fire to get my gear dried and warm up a bit. Other than stupid me, who could possibly be out walking in this shite weather. Camp Creek Hut is an old 6 bunk hut. Imagine my surprise on reaching to hut to find 8 other TA trampers crammed inside. All bunks taken, one would be sleeping on the floor, the 8th in a rigged up hammock in the middle of the hut. Oh no! My worst nightmare. I was going to have to settle for a damp night in my tent. But the crew inside were all very understanding and had all been in this situation themselves. As I set my tent up, they made me a nice hot cup of ginger tea and shuffled around to make room so I could at least get out of the cold and hang some wet gear to dry a little. Eventually I had to make my way out of the hut and into the tent as the others were getting settled for the night. Oh well, town tomorrow and a earned day off I reckon. Sounds trampers are all one big family. The ginger would have warmed you up. Great photos and well done.